Would you believe it's a CRAFT?! I’m having a quieter week as it pertains to the blog. Partaking in conversations with friends over coffee and the phone, investing in my marriage, and making plans to make one daughter’s wish come true of homemade Valentine’s cookies for her class (hope they’re as good as she’s built them up in her head!). I’m also processing some thoughts I’m having about what God is doing in my own heart related to voice. Something’s stirring up inside me. How, when it comes to using our voice, we must choose ourselves, how there’s value and importance in just one single voice, as well as pondering the voices which have positively and powerfully affected me in the past and still do today. I look forward to sharing more about that starting next week. I’m especially excited to share some stories with you–one of which, in particular–I’ve been wanting to share since I first started this blog. This has been a game-changer for our mornings. 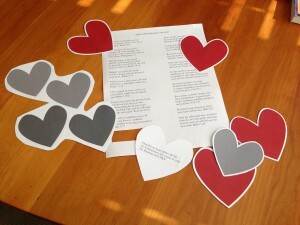 When the arguing started up yesterday over who could hold the cereal box at the breakfast table, I tossed out the idea to grab a couple of hearts and start learning the verses. Before I knew it the sharp words had come to an abrupt halt and the girls were quizzing one another on Bible verses! You should know this is totally and completely the idea of Landee See Landee Do. The reason the reluctant crafter in me decided to do it in the first place is because she makes it a no-brainer. Visit her site to see her post about it (complete with better pics than mine) as well as a link to the pdf you can use for printing the hearts. Since I don’t own a color printer I simply emailed the document to my friend John at the local UPS Store and paid a few quarters for them to be printed on cardstock. Here’s the twist I added: I printed scriptures pertaining to the heart and had Lauren glue one on the back of each heart. She insisted it would be easier for her to learn them if they were on the front of the hearts but, heck, they’re just so much cuter this way. She’s right, though, so decide for yourself what’s best. Verses like Psalm 9:1, 13:5, 19:14, 37:4, and 119:11 are great ones as well as Proverbs 4:23, Matthew 6:21 and 11:29. If you print two of each of the sheets Landee has linked, you’ll need fourteen verse so use your Bible concordance or Bible Gateway for ones you like best and that are age-appropriate for your kids. They can be shortened to half the verse for young kids if need be. I’m leaving our garland up the rest of the month (I realize Valentine’s Day is two days off, but I’d rather do it late than not at all). If you’re still hesitant–It’s just one more thing. How do I find the time? I hate crafts!–Remember how Jesus turned water into wine? Well, telling my kids there will be a special reward at the end of the month if they memorize a certain number of verses, has turned the usual breakfast-time insults and snide looks into a time of spoken truth and healing smiles. I like the taste of this much better. Let’s face it: this isn’t for them; it’s for me. Postscript: If you came across this post while searching for craft inspiration from super-creative and brilliant people, then you are in the WRONG place. Run, I tell you! RUN for the pinterest hills people! Of course, if you’re in need of some hope and encouragement then I’d be honored to provide that to you every once in a while. By all means, please come again. If you haven’t already, be sure to “like” me on Facebook (if you do) to have updates show up in your news feed! Where do you stand on the craft spectrum - Pinterest junkie or craft scoffer?